People pronounce it as KOI ('coil' without the 'l' sound), but I prefer pronouncing it as KOI ('coi'ncident or コイ). 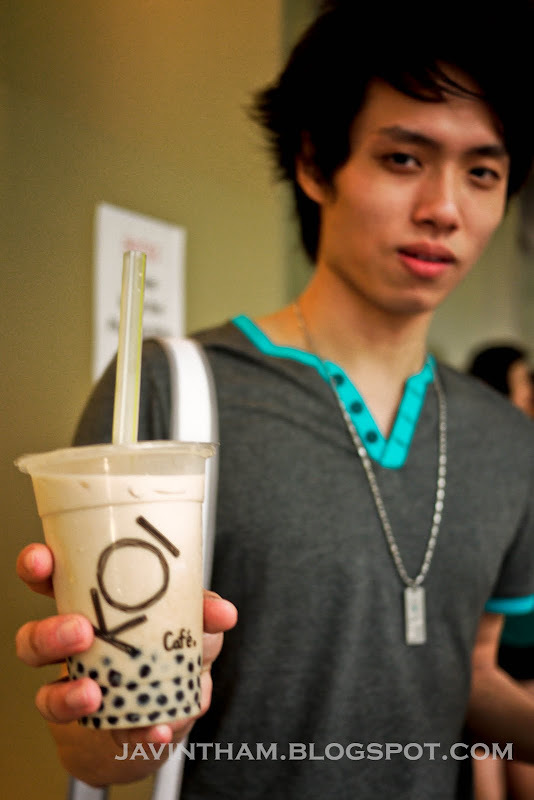 As one of the most best selling bubble tea store in Singapore, KOI Café successfully attracts its customers with the irresistible fragrance of their bubble tea with customer's own choice of sugar level. This is revealed from the willingness of customers spending their time lining up a long queue just for a cup of bubble tea. The pearls are smaller than usual but are given in a bigger portion so that it's easier to sip and each time you can munch more pearls. A couple of months ago I was told by one of my friends about the origin of the word "KOI" - it's a 90˚ clockwise rotation of the Chinese character "豆", which means "bean". My goodness, how true it is, and how come I never thought of that?! Haha... though I'm still wondering whether that's the actual origin of "KOI".